The 40-point mark - the magic number that is supposedly needed to guarantee Premier League survival. But with such a compelling relegation scrap this year, we have to ask, is it still true? 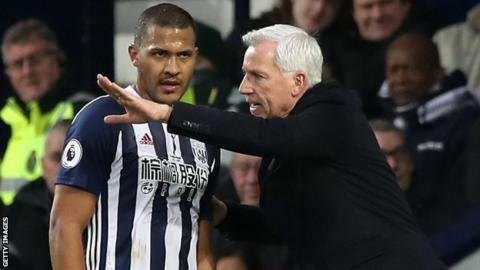 After joining the club in December, West Brom manager Alan Pardew said he would treat himself to a glass of wine when the Baggies reached the 40-point mark, although he added that safety "may be a lot less this year - 35 or 36 points". (They're currently bottom on 20 points, by the way). BBC Sport and data analysts Gracenote Sports have examined the history of the relegation fight to find out who you can expect to be in the bottom three come the end of the season. Looking at stats since the Premier League turned into a 20-team league in 1995-96, on only four occasions has a team needed 40 points or more to stay up. The most recent example was in 2011, when 18th placed Birmingham City went down with 39 points and Midlands rivals Wolves stayed up with 40. The lowest number of points to guarantee survival was 31 points in 2010, as 18th placed Burnley went down with 30 points. The highest points total to survive would have been 43 in 2003, with 18th placed West Ham relegated with 42 points. On average the number of points to guarantee survival in the last 22 seasons has been 36.6 points. Fact: 40 points as a general rule is a myth. But stay with us, as there's predictions to come. So where did this myth come from? Probably from a different Premier League era, two decades ago. Coventry stayed up in 17th with 41 points, relegating Sunderland in 18th with 40, in 1996-97. The next season, 1997-98, Bolton went down on goal difference in 18th, while Everton stayed up in 17th - both finishing with 40 points. Gracenote says that taking averages over five-year periods, the points needed for Premier League survival has dropped from 37 in 1996-2000, to 35 points now. And what about this year's relegation scrap? With 11 games to go, Gracenote has 11 teams in the relegation battle and has calculated the chance of each team being relegated. That's from Bournemouth in 10th, down to bottom side West Brom, while the rest of the Premier League's top nine sides all have a less than 1% chance of going down. Already this season, eight Premier League teams have changed manager - Watford, Crystal Palace, Everton, Leicester City, Stoke, Swansea, West Brom and West Ham. Gracenote uses its Euro Club Index ranking of top-flight clubs and then runs season simulations one million times to estimate the chance of each team being relegated. So how many points will be needed? Using the same formula, Gracenote says 38 points "is more likely than not" to be enough, giving a 62% of staying up, but anything below that and it is a less than 50% chance. "At this stage, it is certain that 40 points will be enough to stay up and that a team getting 34 points will be relegated," says Simon Gleave, head of analysis at Gracenote Sports. Are Man City's players being 'butchered'? Read more on Man City: Raheem Sterling says they are 'butchered' - is he right?